Daily DrawingsI spent 2 years (over the course of 2010-2012) doing a drawing every day (as best I could) in page-a-day drawing journals. Little Green Book DrawingsI received a little hand•book brand drawing book with green binding. It’s a high-quality book with thick paper having a slight amount of tooth. I tried to make drawings of quality within it (eventually). This is yet another drawing for which I am unsure of the origin for the initial inspiration. 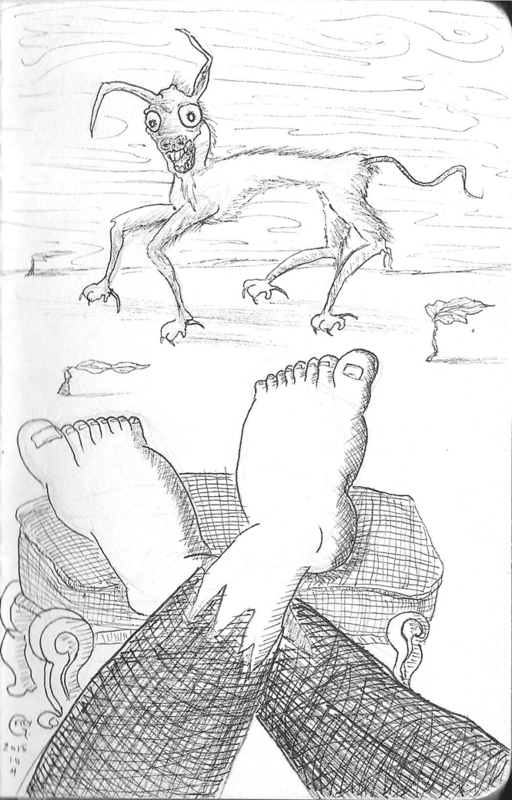 One day, the image of feet with way too many toes got into my head and I knew at some point I would have to put it on paper to exorcise it from my brain. I had some free time at somebody’s house with a goofy dog that is way too big walking around, and I incorporated my impression of her into the drawing as well. I’m not sure what else to say about this. It’s bizarre and semi-surrealistic, yet with some references to reality, as in the ottoman that is drawn from the one in my parents’ house when I was a kid. I used to sit on it and eat right in front of the TV.